Festival director Kier-La Janisse (photo: Cindy Titus). Submissions are now open to the sixth annual Monster Fest, with an early bird deadline of April 29, a regular deadline of June 3 and an extended deadline of August 12. Monster Fest ('Australia’s premier festival of cult, horror and the fantastic') runs November 24-27 at the Lido Cinemas in Melbourne, with support from Screen Australia. 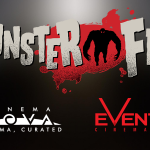 Monster Fest was established in 2011 as the exhibition arm of Monster Pictures. This year it's headed up by new festival director Kier-La Janisse, with programming support from genre scholar Alexandra Heller-Nicholas, and executive produced by Neil Foley and Grant Hardie of Monster Pictures. “We’re already hitting the festival circuit, markets and schools, scouting new films, but I can’t wait for the submissions to start rolling in to see what unheralded discoveries await us”, Janisse said. This year Monster Fest will put a particular emphasis on innovative, experimental approaches to the medium. “We’re officially opening up to expanded cinema proposals this year", said Janisse. "While we have featured such projects in an invited capacity before, this year we wanted to open it up and see what was out there in terms of genre-related media projects that might not be merely conventional time-based screenings". "So presentations, installations, projects that rely on the participation of the artist to maneuver or manipulate the show, creating a one-of-a-kind experience". Submissions can be processed via Film Freeway, WithoutaBox and Film Festival Life. Monster Fest to invade the west.